Here at the hospital we have a season for everything – flea and tick season, heartworm season, hot spot season, and COMING SOON – Bunny and Chicken Season! This is the season when people purchase chicks and bunnies to put in Easter Baskets. Which is delightful for the children on the receiving end of these baskets. Who wouldn’t want to wake up to find a new pet in a basket? The thing about Chicks and Bunnies is that it is extremely important to remember that these are amazing animals that deserve amazing forever homes. If you decide to get one of these pets this spring please remember to plan for a long term household companion. Bunnies are incredibly social animals and can get really sick if you don’t feed them the right food or keep them in the right environment. Bunnies also require a lot of care and maintenance. You can’t just leave them in a hutch outside and forget about them – most of our bunny patients are house rabbits that are litterbox trained!!! Here are some of the reasons that bunnies regularly come in to the hospital. 1. They can get an illness that makes them believe that they are upside down! Its a real thing. We call them Upside Down Bunnies. (This is not the medical term for this condition, by the way). You can tell your bunny has this problem because they are quite literally upside down (or at least their head is). 2. Rabbit teeth grow constantly! Especially if they eat the wrong foods their teeth may not line up correctly, then they don’t wear them down when eating, then their teeth start to grow into their tongue and cheeks – Ouch!!! That means monthly trips to the vet for teeth trims. 3. Rabbits need to eat and poop constantly. If they stop eating for even 12-24 it can be life threatening. It is so important to get them in right away to the doctor so that they have the best chance of getting better. You will have to medicate them, swaddle your bunny up in a towel like a baby (into what we call a Bunny Burrito), and force feed it every four hours with a syringe (including overnight) until it is better. Do you have time for that? Ok, now lets talk about chickens. First of all, you have to build or buy them a coop. That should be part of your plan. They really like to be around other chickens so you shouldn’t have just one. And you never quite know if one of them is a rooster until it is halfway grown and starts attacking your dog. Just like with bunnies, diet and husbandry is the key to keeping chickens healthy. Here are some of the reasons that chickens come to see us at the hospital. 1. They get egg bound. This means that they are trying to pass an egg and it gets stuck and we have to help them with it. 2. They eat things they shouldn’t -like screws and straw and whatever is laying around. Are you prepared to send your chicken to surgery? 3. They get attacked by hawks, neighborhood dogs, and often their rooster friends. Not so much fun for the chickens. Don’t get us wrong – we LOVE our bunny and peep patients and their owners. 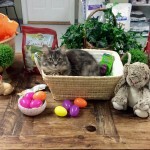 BUT make sure you know what you are getting into before you fill an Easter basket with a fluffy critter – they are a commitment that you must be happy to make. If you do get a bunny or a chicken here are some great resources to help you keep them healthy. We recommend houserabbit.com for information on bunnies and tillysnest.com for information about chickens. The very best way to keep your new pet healthy is to get off on the right foot. Bring your bunny or chicken in to meet Dr. Blake or Dr. Kennedy! They will answer all of your questions and become a valuable resource in keeping your pet healthy.